ViaMedica is a multidisciplinary medical test center that provides patients with quick and easy access to medical testing. Patients will enter a respectful environment with a professional team that is dedicated to the individual care and well being of each patient. ViaMedica with state of the art equipment provides referring physicians with high quality, reliable, accurate and timely diagnostic results for their patients. Physicians will be able to effectively and efficiently assess their patients’ treatment needs. Through our network of specialized physicians and healthcare professionals, ViaMedica is dedicated to providing the finest in diagnostic services. Dr. Lepanto is Associate Clinical Professor of Radiology at Centre hospitalier de l’université de Montréal (CHUM) with close to 20 years experience in abdominal imaging. He is also director of the Health Technology Assessment Unit at the CHUM. He has authored or co-authored over 30 articles in scientific journals and has presented at numerous national and international conferences. All technologists and sonographers are graduates of accredited training programs. All obstetric sonographers are certified through the Fetal Medicine Foundation (FMF). All clinical staff members are CPR certified. Our Radiologists are affiliated with the Centre hospitalier de l’université de Montréal (CHUM) and the McGill University Health Centre (MUHC). 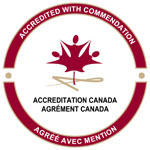 ViaMedica is proud to announce that through our voluntary participation in Accreditation Canada, we have been awarded Accreditation with Commendation by meeting and surpassing the rigorous quality and safety standards required to participate in this ongoing program. ViaMedica is committed to offering patients safe, high quality services. To access our requisition forms, click here. To know more about our radiology equipment, click here. To access our PACS ACCESS-MD Portal, click here.